Ok, too may guitars and this one isn't getting played. 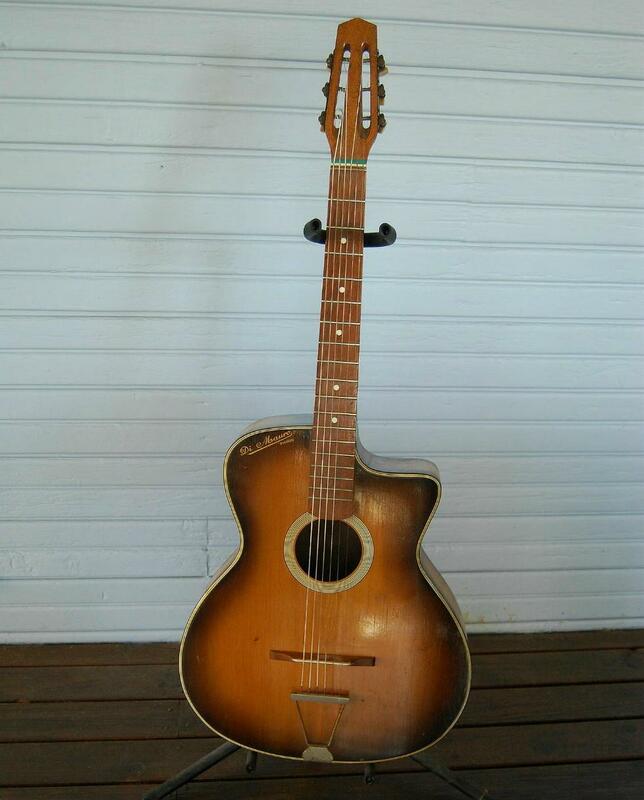 Excellent condition and a bargain price for a real vintage Di Mauro. I am in Australia so for overseas buyers bear in mind shipping costs and the delay to get the CITES certificate. The former would be about $320 including CITES which can take up to 40 days max to process (although it can be a lot less). The CITES application can't be applied for in advance because they need the recipients details for the application, so the delay is inevitable, but hey, how often do these come up? Anyway, here is the ebay link and I can accept Paypal. These are great guitars - I love mine. Light as a feather (3 lb 12 oz / 1.7 kg). There's very little movement of the top or neck with change in season, and those old tuners keep it up to pitch very well. If it were already in the US, I'd be tempted at that price. I like the look of that old skool sunburst. Still available for AU$1250 - about US$905 at today's rates - plus shipping. I know probably most people who read this are not in Australia, mostly USA I guess, but I have had to cancel the ebay listing and will relist it as Australia only because due to the latest CITES regulations requiring a certificate for anything containing a listed timber, in this case rosewood, it will take time to arrange. I have had a lot of enquiries from overseas but it can not be sent without a CITES certificate, and the application for that can take up to 40 days (although it should be a lot less), so as ebay insists I accept payment by Paypal, and the buyer can claim a refund for something that has not arrived within a 'reasonable time' it is too risky for me. If you can come up with another way of paying for it and are prepared to wait up to fifty days then maybe.